A woman leading protests over the abduction of more than 200 girls in Nigeria has been detained on the orders of the president's wife, activists say. Naomi Mutah took part in a meeting called by First Lady Patience Jonathan and was then taken to a police station, they say. 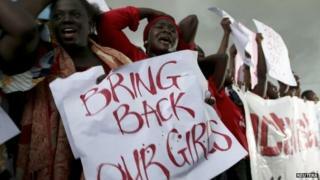 Mrs Jonathan reportedly felt slighted that the mothers of the abducted girls had sent Ms Mutah to the meeting. Analysts say Mrs Jonathan is a politically powerful figure. Ms Mutah, a representative of the Chibok community where the girls were seized from their school more than two weeks ago, last week organised a protest outside parliament in the capital, Abuja. The protesters, and many Nigerians, feel the government has not done enough to find the missing girls, who are thought to have been kidnapped by militant Islamist group Boko Haram. Boko Haram has not commented on the accusation. President Goodluck Jonathan on Sunday night spoke for the first time about the abductions. In a live TV broadcast, he said he did not know where the girls were but said everything was being done to find them. Media captionPresident Goodluck Jonathan: "Wherever these girls are, we will surely get them out"
Pogo Bitrus, another Chibok community leader, told the BBC he had been to the Asokoro police station where Ms Mutah is reported to have been taken but could find no written record of her being there. He described the detention as "unfortunate" and "insensitive". He said he hoped Mrs Jonathan would soon "realise her mistake". Mr Bitrus noted that Mrs Jonathan has no constitutional power to order arrests. The AP news agency quotes another community leader, Saratu Angus Ndirpaya, as saying that Mrs Jonathan accused the activists of fabricating the abductions to give the government a bad name. She also said the First Lady accused them of supporting Boko Haram.